Nothing can be better than losing weight without starving yourself or eating bland food. Nutrition-dense and tasty foods will keep you active physically and mentally and also aid weight loss. 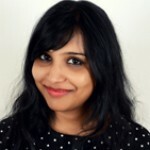 Taking a little time out to cook delicious foods is really a small price to pay when compared to spending on weight loss pills and surgery to lose a few pounds. If you are on a long-term weight loss plan, these recipes will turn out to be your best friends. These 30 lip-smacking diet recipes for weight loss are easy to cook and take less time than the pizza delivery guy. Blend the slices with the rest of the ingredients. Banana is rich in potassium, vitamins B6 and C, and antioxidants that protect your body from degenerative disorders (1). Milk is a good source of calcium and helps to strengthen your bones. Flaxseed is loaded with magnesium, calcium, iron, vitamin B6, omega-3 fatty acids, and alpha-linolenic acid, which help protect against cardiovascular disease (2). Honey is a natural sweetener. All these together give your day a healthy start and also help you lose weight. Add the oats and cook them until they are soft and chewy. Dice the berries and add them to the bowl of oats. Wrap the hazelnuts in a zipper bag and lightly bash the bag with a rolling pin. Add the nuts to the bowl of oats. Eat while it is still hot. 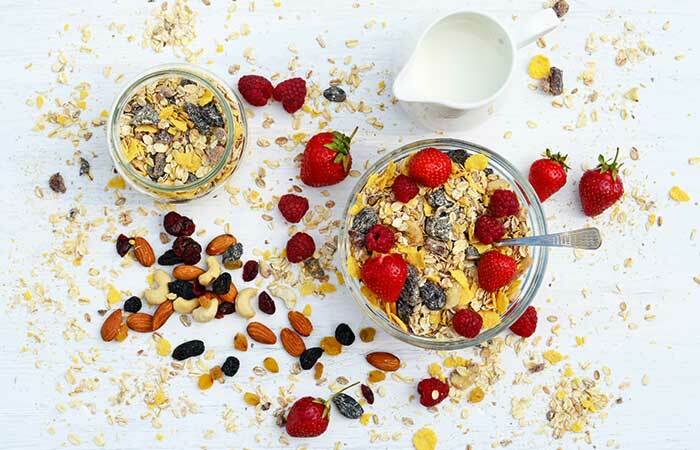 Oats are loaded with beta-glucan, which helps to maintain good heart health (3). Berries are rich in micronutrients and fiber that help to improve LDL oxidation and glucose metabolism and prevent lipid peroxidation (4). Nuts are energy-dense foods and they have antioxidant and anti-inflammatory properties (5). Cut the papaya, grapefruit, and watermelon into medium-sized cubes and place them in a bowl. Cut the passionfruit in half and scoop out the golden goodness. Finally, add a dash of lemon and a pinch each of salt and pepper. Papayas are an excellent source of vitamins A, C, and B, and proteolytic enzymes such as papain and chymopapain, which have antibacterial, antifungal, and antiviral properties (6). Grapefruit helps to control weight and regulate blood pressure (7). The cis-isomeric lycopene content of watermelon makes it an anti-cancer agent and protects you from diabetes, cardiovascular diseases, and macular diseases (8). Passionfruit contains antioxidants that prevent photoaging (9). Grapes are rich in flavonoids and polyphenols, which help protect from microbial infection and cancer (10). Roughly chop the kale leaves, tomato, and the cucumber and throw them in the blender. Add the black grapes and give it a spin. Add salt, stir well and drink. Kale is one of this era’s superfoods. It is rich in vitamins A, C, and B6, and has antioxidant and anti-inflammatory properties. It reduces the risk of coronary artery diseases (11). Tomato is rich in potassium, dietary fiber, vitamins E, C, A, and K, copper, lycopene, and manganese. It helps to fight cancer and lowers the risk of cardiovascular disease (12). Black grapes contain many phytonutrients, such as resveratrol and quercetin. Black grapes are also a rich source of anthocyanin, resveratrol, flavonols, and flavanols that help slow down aging and help fight against cancer, heart diseases and microbial diseases (13). Cucumber has a cooling effect; it is rich in dietary fiber, vitamin C, and water content. 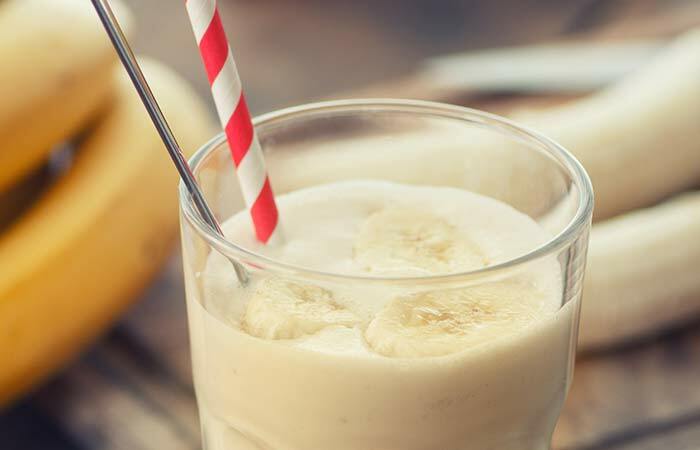 This smoothie will help you lose weight, keep your heart healthy, prevent cancer, strengthen your bones, and relieve indigestion and constipation. Chop all the veggies into small cubes. Heat the oil in a frying pan and add the onions first. When the onions become a little soft, add the bell peppers, broccoli, and tomatoes in this order. Season the veggies and sauté them. Beat the eggs separately in a bowl. Season them. Add the eggs and keep stirring to make soft scrambled eggs. The power of two whole eggs is immense. Egg is a good source of protein, which is what you need to start your day with. It is also a good source of iron, potassium, fats, and vitamin B6. It has antioxidant and anti-inflammatory properties (14). Tomato is rich in potassium, dietary fiber, vitamins E, C, A, and K, copper, lycopene, and manganese. It helps to fight cancer and lowers the risk of cardiovascular disease (12). 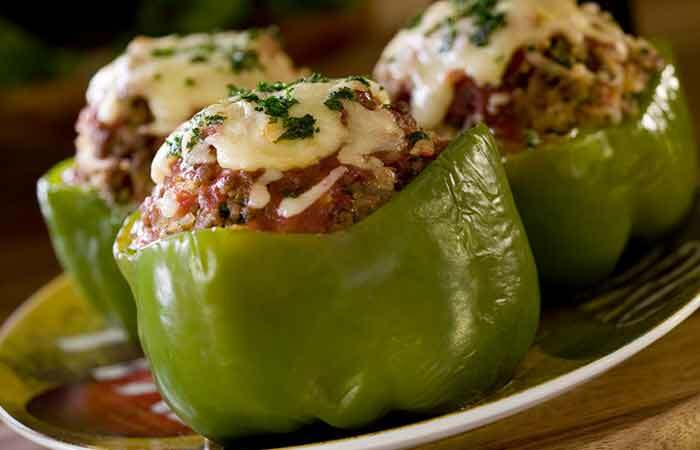 Bell peppers are a good source of vitamins A and C, which help to reduce the risk of many diseases (15). 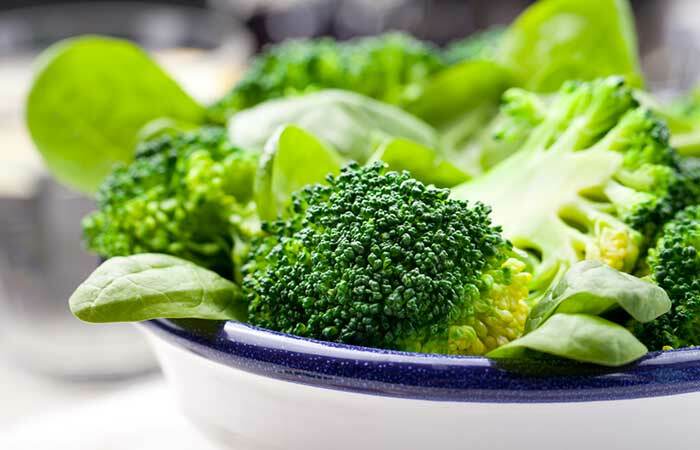 Sulforaphane, which is derived from glucosinolate of broccoli, helps to fight against cancer (16). Add the milk gradually as you beat the eggs lightly. Sift in the flour while stirring the egg and milk mix. 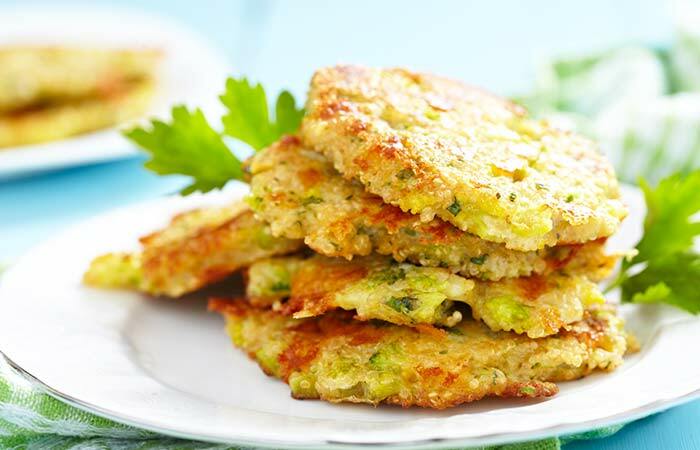 Grate the carrot and cauliflower florets and add into the pancake mix. Finely chop the onions and add to the pancake mix. Add a pinch of salt and cayenne pepper. Add a dollop of the pancake mix and fry until that side is golden brown. Flip it over and fry again. Eat while it is hot. This savory pancake is delicious and nutritious. Eggs are a good source of protein, iron, potassium, fats, and vitamin B6 and have antioxidant and anti-inflammatory properties (14). Cauliflowers are an excellent source of vitamins C and B6, magnesium, calcium, iron, and have anti-inflammatory and antioxidant properties, which help prevent oxidative damage (17). Carrots are rich in vitamins A and C and dietary fiber. They are rich in antioxidants as well and protect the cardiovascular system (18). Whole wheat flour is full of dietary fiber, magnesium, iron, and vitamin B6. Milk is rich in calcium, which will help to strengthen your bones. Roughly chop all the fruits and throw them into a blender. Add a few mint leaves and give it a spin. Now, add the coconut water and stir well. Pour it into a glass and drink while the smoothie is still fresh. Coconut water is the liquid endosperm and is rich in phytonutrients and natural electrolytes. It helps to regulate blood pressure and improve insulin sensitivity (19). Kiwis are rich in micronutrients, which help in lowering the fibrinogen concentrations in the plasma and improving the plasma lipid profile (20). Peaches are a good source of antioxidants and protect your body from oxidative damage (21). Musk melons are a great source of antioxidants, micronutrients, and phytonutrients (22). Mint leaves are a good source of magnesium, calcium, vitamins A and C, iron, and dietary fiber. 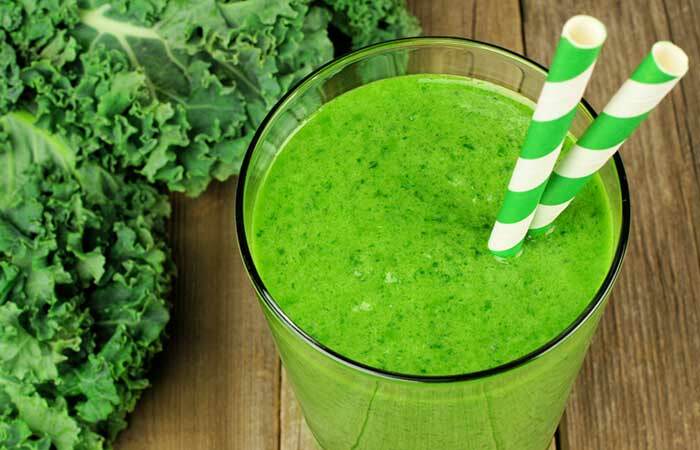 This smoothie will help enhance digestion, detoxify your body, fight cancer, prevent diabetes, and improve heart health. It is good for your skin as well. Finely chop the onion and tomato in a bowl. Slice the chives and add to the bowl. Make zucchini ribbons with a peeler. You can just chop them as well. Add the eggs, salt, and pepper and beat the eggs well. Add the egg mix and cook until you are able to flip it over. Once one side is cooked, layer the smoked turkey bacon strips and zucchini on one side of the omelet. Sprinkle a little salt and pepper on the bacon and zucchini. Flip the other part of the omelet over the turkey bacon and zucchini (like a taco). Cook it for about 15 seconds and transfer the omelet to a plate. 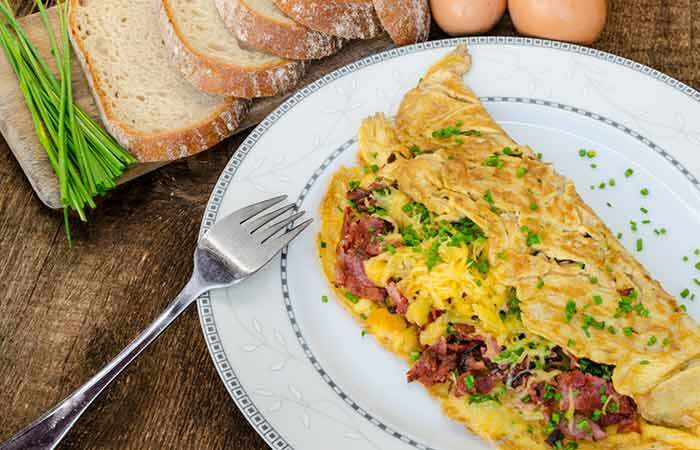 Enjoy the delectable omelet and keep smiling all day! This breakfast needs about 10-15 minutes to cook and is rich in vitamins, minerals, fiber, and protein. It will keep you full for a longer time and keep your hunger pangs at bay. Eggs are a good source of protein, iron, potassium, fats, and vitamin B6 and have antioxidant and anti-inflammatory properties (14). Tomato is rich in potassium, dietary fiber, vitamins E, C, A, and K, copper, lycopene, and manganese. It helps to fight cancer and lowers the risk of cardiovascular disease (12). The ingredients have anti-inflammatory, antioxidant, and antimicrobial properties. They help to maintain blood glucose levels, fight cancer, strengthen bones and muscles, and cleanse the colon. Roughly chop the spinach and cucumber and throw them into the blender. Add the other fruits and give it a spin. Add a pinch of salt and a dash of lime before drinking. Spinach is rich in vitamins A, C, and B6, potassium, iron, and magnesium. It helps to regulate blood pressure (23). Cucumbers have good water content and are low in calories (24). This smoothie will help you fight cancer, skin disorders, and ulcers, strengthen your bones, boost your immunity, protect you from common cold and cough, prevent cardiovascular disease and kidney stone formation, lower cholesterol, prevent skin disorders, and improve cognitive abilities. Cut the peach into medium-sized cubes. Pour warm milk into the bowl of Special K flakes. Add the peach, pumpkin seed powder, and cocoa powder. Special K multigrain flakes are loaded with vitamins A, C, B6, and B12, iron, and dietary fiber. It helps to manage weight, lowers the risk of diabetes and coronary heart disease, and improves gastrointestinal health (25). Peaches are a rich source of vitamin C, potassium, and magnesium. They have anti-inflammatory and antioxidant properties that prevent oxidative damage to your body (26). Pumpkin seeds are a good source of iron, magnesium, protein, and potassium. This breakfast will help you fight cancer, treat indigestion, constipation, and skin disorders, improve heart health, and strengthen the bones (27). Make thick chunks of avocado. Put the shredded chicken breast in the middle of the lettuce leaves. Place the onions on top of the chicken. Add the avocados and the pickled jalapenos. Put the mustard on top and garnish with cilantro. Lettuce is a good source of vitamins E and C and carotenoids. It aids lipid metabolism (28). Chicken breast contains lean protein and avocado is rich in vitamins C and B6, dietary fiber, potassium, and polyunsaturated fatty acids (29) (30). Onion is full of potassium, dietary fiber, and vitamin C. Jalapenos are rich in vitamins C and A, potassium, and dietary fiber (31). Cilantro is a good source of vitamins A and C and dietary fiber. These ingredients will keep your heart healthy, fight cancer, improve your immunity, prevent heart attack or stroke, support the cardiovascular system, strengthen your bones, and lower high blood pressure and bad cholesterol. This lunch will take about 10 minutes to prepare. To prepare the marinade, add a tablespoon each of sesame oil, soy sauce, and fish sauce in a bowl and stir well. Rub the marinade well on the chicken and leave it for five minutes (or overnight). Chop the garlic and keep aside. Julienne the ginger and bell pepper. Thinly slice the spring onion and red chili. Put a tablespoon of sesame oil in a frying pan. When the oil is hot enough, throw in the chopped garlic and sauté. Next, add the ginger and spring onion and fry for about 15 seconds. Add the chicken. Cover with a lid and fry for about 30 seconds. Flip the chicken over and repeat the above step. When the chicken in half cooked, add the bell pepper and the chili, stir, and cover with a lid. Add salt, if needed (fish sauce is quite salty). Cook for about 30-60 seconds more. Prepare the brown rice by pouring half a cup of rice in a cup of water. Let it boil and become fluffy. Chicken breast is a good source of lean protein, and garlic has antibacterial, antifungal, and anti-cancer properties (29), (32). Ginger has anti-inflammatory, antioxidant, and anti-cancer properties (33). Sesame oil is rich in copper, magnesium, calcium, and phytosterols. Fish sauce provides your body with magnesium and vitamins B6 and B12. Capsaicin, found in peppers, promotes metabolism and vascular health (34). Brown rice has a lower glycemic index and helps to lower blood glucose levels (35). Preheat the oven to 180°C and coat the roasting tin with olive oil. Cut the sweet potatoes into medium-sized cubes. Roast the broccoli florets and sweet potato at 200°C for 15 minutes. Meanwhile, boil the French beans and spinach leaves for about two to three minutes. To make the dressing, add olive oil, mustard, lemon juice, chopped dill, and pinch each of salt and pepper into a jar and shake well. Take out the roasted sweet potatoes and broccoli florets and put them in a bowl. Throw in the boiled beans and spinach leaves. Add the salad dressing and toss the veggies to evenly coat them with the dressing. Sweet potatoes are a great alternative to potatoes and are rich in vitamins A, C, and B6 and magnesium, potassium, and beta-carotene (36). Broccoli, spinach, and French beans are also a good source of proteins, vitamins, and minerals (37), (38), (39). Olive oil is a good source of good fats, phytonutrients, and vitamin E. All these ingredients help to maintain the blood sugar levels and lower the risk of cancer, coronary artery disease, diabetes, and stroke. Cut the cucumber in half vertically. Scoop out the seeds part and keep it aside. Roughly chop the seed part of the cucumber and put it in a bowl. Grate the carrot into the bowl. Add the yogurt, chili flakes, olive oil, chopped rosemary, and a pinch of salt. Coat the cucumber hollow with a generous amount of the spiced yogurt. Layer the smoked salmon on top. Sprinkle chopped rosemary on top. Cucumber is a vegetable that is low in calories and high in water content. It has anti-diabetic, anti-oxidative, and lipid lowering properties (40). Salmon is rich in omega-3 fatty acids, vitamins B12, B6, and niacin, and helps lower cholesterol (41). Yogurt helps to fight colon cancer, microbial infections, lactose intolerance, and GI tract inflammation (42). Rosemary helps to fight prostate cancer (43). 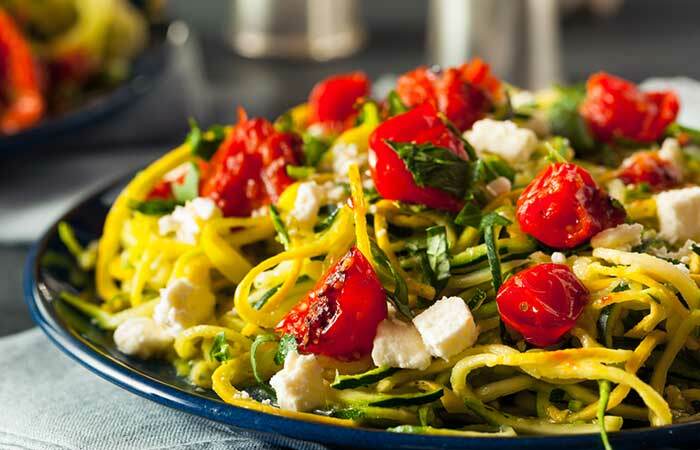 Use a vegetable spiral slicer to make zucchini noodles or zoodles. Put the zoodles in a kitchen towel to soak up the extra moisture. Heat a little olive oil in a frying pan and fry the garlic for 15 seconds. Add the shrimps and cook for about a minute. Meanwhile, cut the cherry tomatoes into halves and roughly chop the lettuce leaf. In another frying pan, cook the zoodles in a little olive oil for about a minute. Put the cooked shrimps and the garlic-flavored oil (if any left in the pan) into a bowl. Add the zoodles, cherry tomatoes, and lettuce to the bowl. Add a little salt, pepper, and dried oregano and toss evenly to coat the spices. Zucchini is low in calories, high in moisture content, and rich in antioxidants such as carotenes, zea-xanthine, and lutein, vitamin C, and minerals such as iron, zinc, and manganese (44). Tomato contains lycopene, which reduce the risk of cardiovascular disease and fight cancer (45). Shrimps are a good source of protein and lower the hepatic cholesterol and serum-lipid concentrations (46). Squeeze the juice of half a lime into a bowl. Add chili flakes, a little vegetable oil, salt, and pepper, and mix well. Rub this mix on the fish fillet and grill it (you may also bake it). Turn over when one side is cooked. Meanwhile, make thin slices of the onion and tomato. Take out the grilled fish fillet and shred it. Place the onion and tomato slices on one multigrain bread. Next, put the lettuce leaf and then the shredded fish. Add the mustard and put the other bread on top. 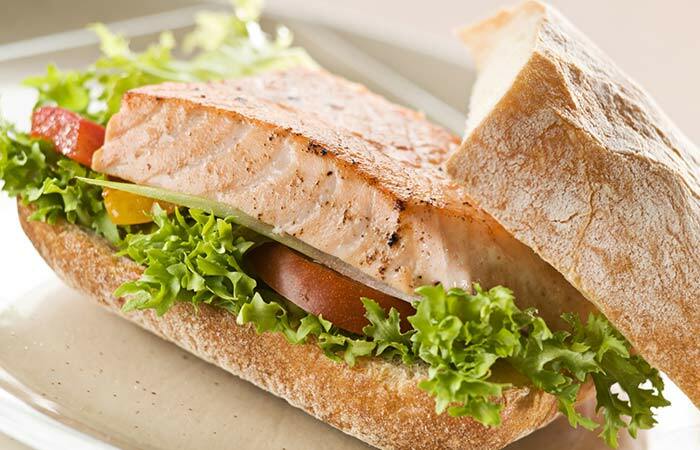 Salmon is rich in omega-3 fatty acids, vitamins B12, B6, and niacin, and helps to lower cholesterol (41). Tomatoes contain lycopene that reduces the risk of cardiovascular disease and fights cancer (45). 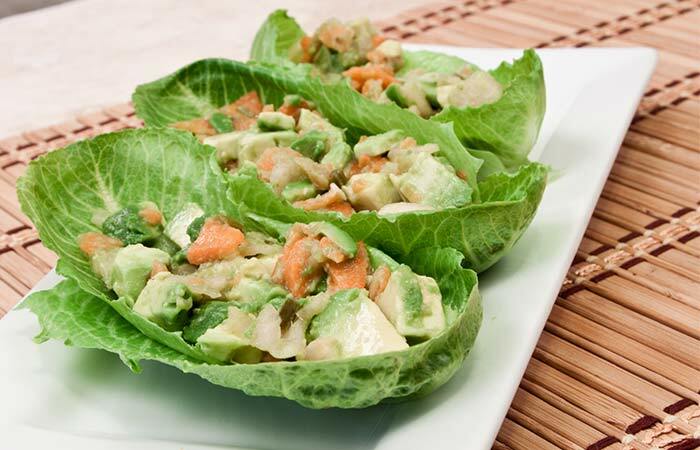 Lettuce helps to metabolize cholesterol and improve the antioxidant levels in the body (47). Onions contain micronutrients that help to reduce the risk of microbial infections and asthma, fight cancer, and prevent blood clot (48). Boil the egg and cut it into four pieces. Chop the onion, tomato, and capsicum into small cubes. Heat a little vegetable oil and add the chopped ingredients. Sauté for about a minute. Add the Indian curry powder and salt (if needed) and stir-fry for about a minute. Add the eggs and let it cook for about 30-45 seconds. If the curry is too runny, cook on high flame to make it thicker. Take the tortilla bread and spread the egg curry. Top it with chopped raw tomato, capsicum, and a little grated cheddar cheese. Eggs are a good source of protein, iron, potassium, fats, and vitamin B6, and have antioxidant and anti-inflammatory properties (14). Tomatoes contain lycopene that reduces the risk of cardiovascular disease and fights cancer (45). Onions contain micronutrients that reduce the risk of microbial infections and asthma, fight cancer, and prevent blood clot (48). The phytonutrients present in capsicum help to fight cancer, reduce cardiovascular disease risk, support digestion, heal gastric ulcers, and relieve pain (49). In a pot of boiling water, throw in the asparagus tips and boil for about two minutes. In another pot, boil the potato. Peel the boiled potato. Season and mash it in a bowl. In a jar, add one tablespoon olive oil, grated garlic, dried thyme, juice of half a lime, mustard, salt, and pepper. Place the mashed potatoes and boiled asparagus tips in a plate and drizzle the dressing on the veggies. Toss and turn the asparagus to coat the dressing evenly. Potatoes are a good source of phytonutrients and vitamins. They are rich in antioxidants and dietary fiber (50). Asparagus is packed with vitamins A, E, C, and K, glutathione. It boosts immunity, improves brain function, reduces inflammation, and prevents microbial diseases (51). Thyme contains vitamins, minerals, and antioxidants that help prevent fungal infections and relieve sore throat (52). Garlic has phytonutrients that help to fight cancer, bacterial, viral, and fungal infections, lower cholesterol, and control blood sugar levels (53). Blanch the broccoli florets in boiling water for about two minutes. Cut the beetroot into medium-sized cubes and put them in a bowl. Add the blanched broccoli florets and ricotta cheese in the bowl. Add a dash of lime juice, apple cider vinegar, and a pinch of salt and cayenne pepper. Toss and turn to mix well. Broccoli helps to fight against colon, pancreatic, breast, and prostate cancers, boosts immunity, improves vision, and strengthens bones (54). Beetroot consumption helps to regulate high blood pressure, improve cognition, and reduce oxidative stress and inflammation (55). Rosemary helps to fight prostate cancer (43). Chop the bell pepper and tomato into small cubes. Place the chopped ingredients on the bread. Add a little salt and chili flakes. Top it with basil leaves and a tiny bit of grated mozzarella cheese. Bake in the oven at 180 ºC for about two minutes. Tomatoes contain lycopene that helps reduce the risk of cardiovascular disease and fight cancer (45). The phytonutrients present in capsicum help to fight cancer, reduce the risk of cardiovascular disease, support digestion, heal gastric ulcers, and relieve pain (49). Corn helps to maintain healthy skin, prevent lung and oral cancers, and delay aging (56). Basil has anti-inflammatory, antimicrobial, and antioxidant properties. It fights oral cancer, improves hemoglobin levels, and improves vision (57). Julienne the carrot, cabbage, and beetroot. Chop the celery in small cubes. In a pot of boiling water, add the ingredients and let them boil until the veggies have softened and the water is infused with all the goodness of the veggies. Pour out the soup into a soup bowl. Add a dash of lime, salt, and pepper. Cabbage protects your body from breast, prostate, and colon cancers, builds immunity against microbial diseases, regulates blood pressure, and protects against Alzheimer’s disease (58). Beetroot consumption helps to regulate high blood pressure, improve cognition, and reduce oxidative stress and inflammation (55). Carrots help to prevent oral and lung cancers, and improve vision and metabolism (59). Celery is a negative-calorie food and helps lower the blood sugar and serum-lipid levels and scavenge the oxygen radicals (60). French beans improve vision, are helpful for pregnant women, help in cell division, and lower blood pressure (61). Thinly slice the chives and put them in a bowl. Add olive oil, salt, and pepper in the bowl and mix well. Rub this mix on the salmon fillet. Grill the salmon fillet and broccoli. 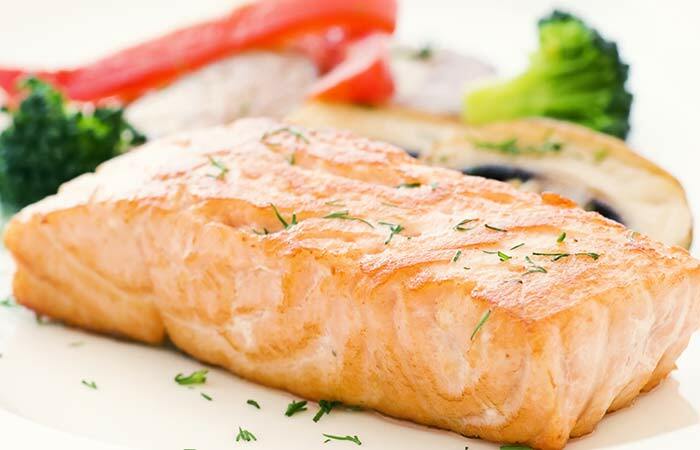 Salmon is rich in omega-3 fatty acids, vitamins B12, B6, and niacin, and helps to lower cholesterol (41). Broccolis help to fight against colon, pancreatic, breast, and prostate cancers, boost immunity, improve vision, and strengthen bones (54). Chives reduce the risk of heart attack or stroke, oral cavity cancer, strengthen bones, and boost immunity (62). Roughly chop the kale and lettuce leaves and put them in a bowl. Add thinly sliced onion and tomato. Garnish with a handful of pomegranate seeds. Lettuce is a good source of vitamins E and C and carotenoids. It aids lipid metabolism (28). Kale aids weight loss and red blood cell formation, improves vision, fights lung cancer, and improves skin health (63). Tomatoes contain lycopene that helps to reduce the risk of cardiovascular disease and fight cancer (45). Onions contain micronutrients that reduce the risk of microbial infections and asthma, help to fight cancer, and prevent blood clot (48). Pomegranate reduces cholesterol, boosts immunity, burns fat, and fights against prostate cancer (64). Blanch the cauliflower, broccoli, and diced carrots in boiling water. Take the veggies out and put them in a blender. Add the garlic clove to the blender and give it a spin. In a frying pan, sauté chopped onion. When golden brown, transfer the onions to a pot and add two cups of water. Add the chicken and salt and cook for about five minutes on medium flame with the lid on. Add the blended veggies and cook for five more minutes on medium flame with the lid on. Serve in a soup bowl and sprinkle a little salt (if needed) and pepper. Chicken breast contains lean protein and avocado is rich in vitamins C and B6, dietary fiber, potassium, and polyunsaturated fatty acids (29), (30). Onions contain micronutrients that help to reduce the risk of microbial infections and asthma, fight cancer, and prevent blood clot (48). Carrots help to prevent oral and lung cancer and improve vision and metabolism (59). Broccoli helps to fight against colon, pancreatic, breast, and prostate cancers, boost immunity, improve vision, and strengthen bones (54). Garlic has phytonutrients that help to fight cancer, bacterial, viral, and fungal infections, lower cholesterol, and control blood sugar levels (53). Cauliflowers are an excellent source of vitamins C and B6, magnesium, calcium, iron, and have anti-inflammatory and antioxidant properties that help protect against oxidative damage (17). Julienne the papaya and tomato. Dice the long beans and red chili. Put the veggies into a bowl. Add a dash of lime juice and salt. 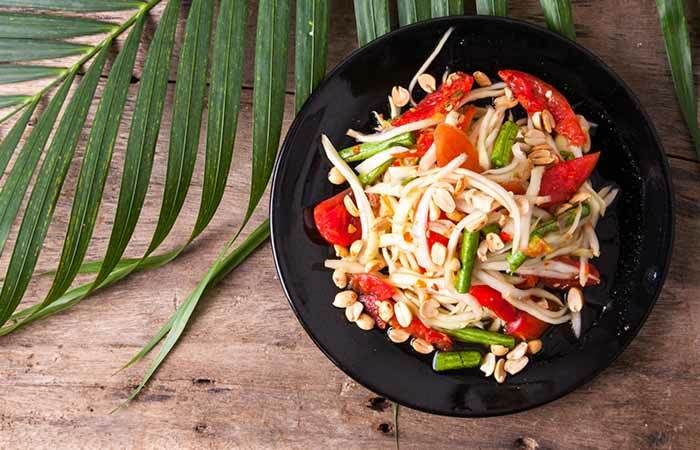 Garnish with chopped coriander and peanuts. Nuts improve cell membrane health, brain function, and also aid loss in water weight (65). Papaya contains vitamins A, B, and C, and minerals like calcium and potassium. It helps to scavenge oxygen radicals, supports digestion, protects against lung cancer, and improves vision (66). Tomatoes contain lycopene that reduces the risk of cardiovascular disease and fights cancer (45). Cut the top part of the capsicum and take out the seeds. Chop the tomato and onion into medium-sized cubes. Now add the tomatoes and a bit of salt and cook for about 30 seconds. Add the cumin powder, dried mango powder, garam masala, and chili powder. Stir well and cook for a minute. Add the boiled chickpeas and cook for about 30 seconds. In the meanwhile, cook the brown rice in two cups of boiling water. Mix the chickpeas and rice and put the mixture into the hollow of the capsicum. Bake in a preheated oven at 200 ºC for three minutes. Take out from the oven and garnish with chopped coriander. Peel and cut the butternut squash into medium-sized cubes and put it on a baking tray. In a frying pan, add a little olive oil and fry the cumin seeds. Pour the oil and cumin seeds on the baking tray. Add the chopped garlic, turkey bacon strips, and seasoning. Place the tray in the oven at 200ºC for five minutes. Take out the tray and transfer the ingredients to a plate. Add a dash of lime and honey. Butternut squash is a good source of vitamins A, C, and B6, magnesium, and calcium. It helps to control weight and cholesterol levels (68). Turkey contains a good amount of lean protein, and parsley is rich in vitamins A and C, iron, and dietary fiber. Turkey meat helps to lower the blood glucose levels and fights gastric, colorectal, skin, and lung cancers (69). Garlic has phytonutrients that help to fight cancer, bacterial, viral, and fungal infections, lower cholesterol, and control blood sugar levels (53). Honey helps to soothe the GI tract, prevents cardiovascular disease, and reduces inflammation (70). Chop the onion and tomato into medium-sized cubes. Slice the green chili and garlic. Into a pot, add water, lentils, and Brussels sprouts. Allow it to boil. Half way through, add garlic and tomato and cook for three minutes. Finally, add the chilis and salt to taste. Cook for about a minute. 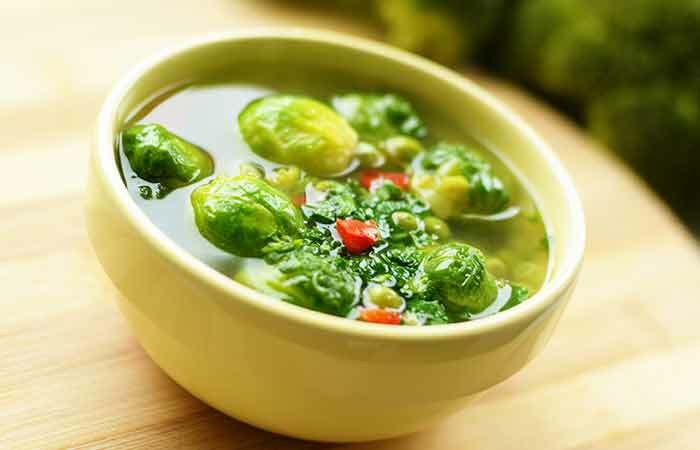 Brussels sprouts help to boost the immune system, support digestion and fat metabolization, and improve bone health (71). Garlic has phytonutrients that help to fight cancer, bacterial, viral, and fungal infections, lower cholesterol, and control blood sugar levels (53). Tomatoes contain lycopene that helps to reduce the risk of cardiovascular disease and fight cancer (45). Onions contain micronutrients that help to reduce the risk of microbial infections and asthma, fight cancer, and prevent blood clot (48). In a small bowl, squeeze the juice of a lime and half a pomegranate. Add coconut water to it and some salt and pepper. Add the shrimps to this mix. Let the shrimps take up all the juices for about 10 minutes. Chop the onion, cucumber, and tomato into medium-sized cubes. In a separate medium-sized bowl, throw in the chopped ingredients. Cut the avocado in half, scoop out the buttery flesh, and cut it into medium-sized cubes. Add the avocado into the bowl containing chopped veggies. Cut the shrimps into medium cubes and add them to the bowl of veggies. Shrimps are a good source of protein and help to lower hepatic cholesterol and serum-lipid concentrations (46). Coconut water is the liquid endosperm and is rich in phytonutrients and natural electrolytes. It helps to regulate blood pressure and improve insulin sensitivity (19). Tomatoes contain lycopene that helps to reduce the risk of cardiovascular disease and fight cancer (45). Onions contain micronutrients that help to reduce the risk of microbial infections and asthma, fight cancer, and prevent blood clot (48). Pomegranate reduces cholesterol, boosts immunity, burns fat, and fights against prostate cancer (64). Avocado is rich in vitamins C and B6, dietary fiber, potassium, and polyunsaturated fatty acids (30). Throw in the garlic and cook until golden brown. Add the onion and cook for a minute. Add the mushrooms and salt. Cook for a couple of minutes. Add the boiled brown rice and toss all the ingredients. Add the dried thyme and mix well. Mushrooms are a good source of protein and help to reduce the risk of heart disease, aid weight loss, prevent diabetes, and fight cancer (72). Onions contain micronutrients that help to reduce the risk of microbial infections and asthma, fight cancer, and prevent blood clot (48). Garlic has phytonutrients that help to fight cancer, bacterial, viral, and fungal infections, lower cholesterol, and control blood sugar levels (53). Thyme contains vitamins, minerals, and antioxidants that help to prevent fungal infections and relieve a sore throat (52). Brown rice helps to reduce cholesterol, prevents insulin resistance, and lowers glycemic response (73). Lastly, I would like to add that exercising is as important as eating well. Hit the gym thrice a week or play a sport to accelerate weight loss and strengthen your bones and muscles. 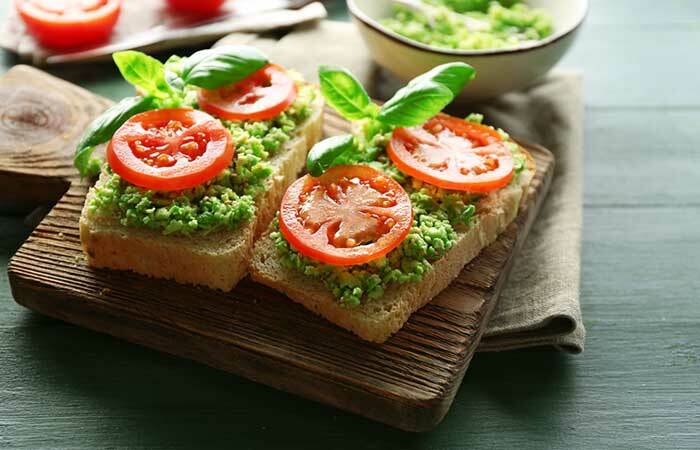 Hope you will relish these delicious low-calorie recipes. Let us know if you have any low-calorie recipes or if you like any of the above recipes by commenting below.